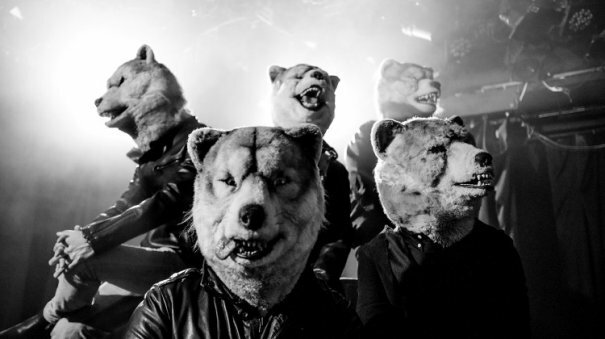 With just one look, you should know that MAN WITH A MISSION is not your average rock band. Comprised of Tokyo Tanaka (Vo), Jean-Ken Johnny (Gt, Vo), Kamikaze Boy (Ba), DJ Santa Monica and Spear Rib (Dr), these wolf-headed rockers are set to shake the world with their monumental music (and looks). As the wolves celebrate their 5th anniversary since waking up from their deep slumber in the Antarctic glacier due to global warming, JpopAsia seized the chance to discuss with the band regarding their past, present and future. Tell us more about your days spent with your creator, Dr. Jimi - what music did he share and what fond memories do you have with him? How has he inspired MAN WITH A MISSION to take on the path of music? Actually Dr. Jimi didn't directly inspire us, but I recall he was pretty stellar on guitar. Which villainous leader did MAN WITH A MISSION had the hardest time confronting with? I remember Doctor Doom was a pretty complicated and misunderstood character; and, then, there was Iron Man, after he joined forces with the other side. Did MAN WITH A MISSION contribute to any historical events? Perhaps, a significant event that led to Dr. Jimi deciding to freeze all of you? For your own personal safety, I'm not going to disclose more than what I'm telling you now. Which era of music did MAN WITH A MISSION specifically enjoy during the period of time when you were frozen? The alternative music scene in the 90's had a tremendous influence on me personally. The mixture-rock scene played a part and had a large influence on all of us. The band listens to a wide variety of music, from HI-STANDARD to NIRVANA and even Scatman John. Does this play a factor in MAN WITH A MISSION's style of music? I'm not really sure about Scatman John - but all the music we listen to inspires us and the way we write songs in many ways. I believe that's a part of the beauty and the great heritage we feel in listening to music. How are you inspired to write the lyrics to your songs? We realized from some of your lyrics that you have gone through quite a lot of struggles in life. Everybody has their own struggles and everybody shares and notices the same pain, pleasure, glory, breakdown whatever in each of our lives. I believe that struggle is one of the most common experiences we share. I don't have to be literally "inspired" but I think that it's the common feeling I have in everyday life and what I've been through so far. How has the music of MAN WITH A MISSION changed over the span of 5 years since waking up from deep slumber? I believe the fundamental core of our music hasn't changed, but we do get inspired with new elements we think are interesting. As long as the core doesn't change, we can and are willing to try anything. How has MAN WITH A MISSION's relationship evolved over time and how has it impacted the band's music? Each member has their own life, experiences and emotions. It's really difficult for me to note what those specific changes are - or have been - but that's part of the fun isn't it? MAN WITH A MISSION has successfully conquered Japan and US, what are your plans to take over other parts of the world? We still have a lot more to do, even in Japan, and of course, the US. I guess we just have to keep on going. All I can say is you'd better watch out for them wolves. A new year brings a new set of resolutions. What are each members' resolution for 2015? Will Spear Rib ever stop saying "niku"? Will Kamikaze Boy learn to deal with his stress and stop drinking? I don't think they'll ever stop. 2015 is our 5th anniversary since we returned to this world. A lot of things are gonna happen and we're totally ready for it. See you guyz all over the world. For more of MAN WITH A MISSION, follow them on Twitter and like them on their Facebook page! Eh, Spear Rib says "niku"? I want to hear that. And about Kamikaze Boy, stopping drinking seems impossible, ha ha.